Seems like more than One Last Strike…as Tim Marchman comes across this gem. The next page reveals that La Russa misheard the phone call and thought Andrew Lincoln won the Cy Young. He was fine with Lincecum. If Keith Law had voted Wainwright second or third, instead of leaving him off the ballot, he would still have finished behind Lincecum. Tweren't one writer who cost him the Cy. It wasn't Law that cost him the Cy Young. It was the fact that Lincecum was more deserving. Honestly no matter how I wanted to vote, I couldn't find a way to justify Adam as first on a ballot. If you go by Rate, Carpenter deserved the first spot, if you go by overall value, then Lincecum deserved that spot, Wainwright didn't have an argument over Lincecum that wouldn't vault Carpenter ahead of him, and he didn't have an argument over Carpenter that wouldn't have vaulted Lincecum over him. Law was pigheaded, but the right man won the Cy Young. My guess is that critics of TLR are going to find and highlight passages to "prove" something. Weird that he would be so upset that Wainwright didn't win considering he finished 3rd behind one of his teammates. Lincecum only won 15 that year for the Giants despite the Giants' gargantuan offense of Emmanuel Burriss, Travis Ishikawa and Fred Lewis. When he didn't get the Cy Young in 2010? My only quibble with those two years is that Lincecum was a VERY close candidate in either year. I'd be happy if he won once, and unhappy if he didn't win - but also unhappy that he won both. The book cover indicates that TLR is the author "with Rick Hummel." Could be a MSM salvo that TLR was willing to put out there to give his ghostwriter some trash-talking largesse. Such a scenario would probably better explain why the reference is so shoddy. He left the park and drowned his sorrows in alcohol. Plenty of strong alcohol. Has TLR ever had an incident with alcohol? I can never tell from the comments from any article associated with him. Spring training DUI in 2007. Supposedly he fell asleep at a traffic light and then it turned green.....and then red.....and then green. Yea, I had never heard about that because no one ever brings it up ever. I'm willing to bet that #12 was sarcasm. The dead horse nature of the alcohol comments is pretty tedious. Agreed. Especially considering that AFAIK he's never had another such incident in his life, and that he was tested at .08-something, which wasn't even over the limit in a lot of states until the feds pushed for .08 limits in the last couple of decades. The book cover indicates that TLR is the author "with Rick Hummel." I would love to get my hands on an original TLR manuscript before edits and polish. Based on his usual interviews and responses to reporter queries, we could use such a sample to test aspiring cryptologists for generations. Don Malcolm, #10, says "The book cover indicates that TLR is the author "with Rick Hummel." Could be a MSM salvo that TLR was willing to put out there to give his ghostwriter some trash-talking largesse. Such a scenario would probably better explain why the reference is so shoddy." Law didn't leave him off his ballot. He voted Wainwright third. It was Carpenter who he left off his ballot. Honestly, there is so much that LaRussa has wrong here that it's pointless paying any attention to his rantings. First off, he says it was 2010. 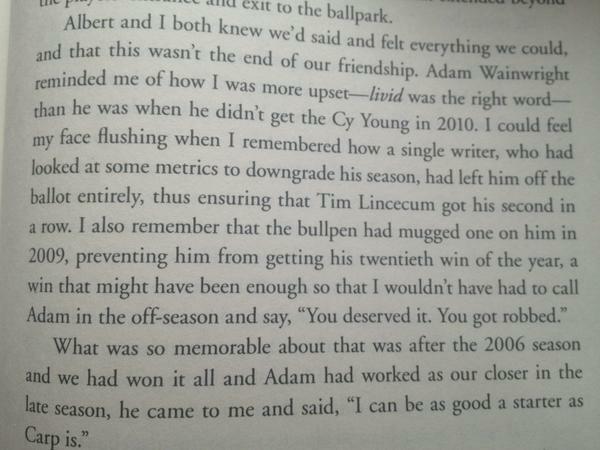 But when Wainwright finished 2nd in the Cy voting in 2010, it was Halladay who won it, not Lincecum. Now, if he really meant to say 2009, that's when Lincecum won his second in a row. But it was Carpenter who came in second, not Wainwright (he finished third) in '09. And even if Law had voted Wainwright first, Lincecum would still have won. That point has been brought up, just like it's been mentioned that in that excerpt it never mentions Law as the writer that TLR is ticked off at.